Ever had one of those nights where the only thing you feel like eating is pizza? And it's still a few days to payday, so you're looking for something cheap, but you're kind of fussy too, so something from a fast food chain just isn't going to cut it? Such was my state of mind when I chanced upon the revamped menu at inner-city watering hole the Queens Arms Hotel (known affectionately to regulars as the QA Hotel), situated in the upmarket part of New Farm's James Street. On Thursday nights, the QA Hotel offers diners a two pizzas for $19.90 deal. Thin crusts showcase generous toppings which range from the usual suspects, like margherita and meatlovers, through to more unexpected combinations. My personal favourite is the spicy prawn, which incorporates chorizo, chilli, onions and prawns - and is topped with rocket tossed in chilli oil for good measure. 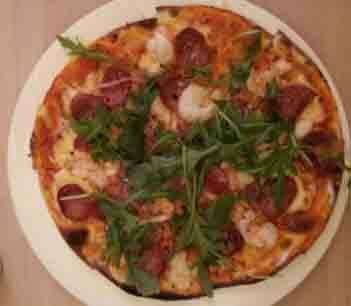 The QA Hotel's spicy prawn pizza packs a punch. Close second is the veggie supreme which arrives loaded with olives, pumpkin, tomato, onion and pinenuts. Gluten-free bases are also available for an additional $3. If you don't fancy pizza, alternatives include blue swimmer crab lasagne ($28), chicken parmigiana ($23) and good old bangers and mash ($20.90). The hotel, which has undergone extensive refurbishment recently, has a real British feel about it - from the Union Jack upholstered dining chairs through to the crown emblem which graces the menus. There's a further nod to tradition downstairs where the original cellars dating back to the late 1800s have been turned into an atmospheric function space. A handful of things went awry during our visit - the wrong drink arrived at the table, the food was a little on the slow side - but these minor niggles were neutralised through the application of ample apologies and the offer of dessert on the house. The QA Hotel has other special meal deals that are worth checking out. For example, on Monday and Tuesday nights, there's a two-for-one steaks deal and a $12 executive lunch deal is available seven days a week from 12-5pm. An onsite bottleshop is also open seven days from 10am until late. It's maybe a female thing, but the other thing I really like about the QA Hotel is the carpark right beside the venue. It's a bit rough and ready (and I wonder how long it will last given its location on a prime strip of real estate) but being able to leave your wheels next door makes it easy to head there after work - and head home safely and without hassle. The veggie supreme sounds like something new to try. Never had nuts on a pizza. Or pumpkin for that matter.